Om en måned fyller Willie Hugh Nelson 79. To uker senere, 15. mai, starter nedtellingen til hans 80-års dag med utgivelsen av det nye albumet »Heroes«, under en ny kontrakt med Legacy Records (Sony). Et album der Willie får hjelp av sine sønner, Lukas og Micah, samt den nye outlaw country sjefen Jamey Johnson. Videre veteraner i faget som Merle Haggard, Kris Kristofferson, Ray Price, Billy Joe Shaver og Snoop Dogg. Selvfølgelig er Sheryl Crow med. Legacy Recordings has announced the upcoming release of Heroes, the eagerly-awaited album of new songs and re-imagined classics performed by Willie Nelson, America's legendary outlaw country music avatar, on Tuesday, May 15. The first release under the artist's historic new deal with Legacy, Heroes is essential Willie Nelson, a seamless collection of top-flight pop-country songs (including covers from the 30s and 40s and new songs by Willie, his sons, Lukas Nelson and Micah Nelson, and more) performed with the easy-going homespun warmth and honesty that have become his trademarks. The album opens with Willie and Merle Haggard joining forces on a powerful new rendition of Wayne (»The Letter,« »Always On My Mind«) Carson's »A Horse Called Music« (the title song from Willie's 1989 album) then tears into the rollicking »Roll Me Up and Smoke Me When I Die,« one of the album's new Willie Nelson songs (this one cowritten with Buddy Cannon, Rich Alves, John Colgin and Mike McQuerry with the recording featuring special guests Snoop Dogg, Kris Kristofferson and Jamey Johnson). Other brand-new Willie Nelson compositions making their debut on Heroes are »Hero,« featuring guest appearances by Jamey Johnson and Billy Joe Shaver, and »Come On Back Jesus« (co-written with Buddy Cannon and Micah Nelson) featuring Lukas Nelson and Micah Nelson. The collection includes producer Buddy Cannon's new composition, »That's All There Is To This Song« and three tunes penned by Lukas Nelson--»No Place To Fly,« »Every Time He Drinks He Thinks of Her,« and »The Sound of Your Memory« (cowritten with Elizabeth Rainey). Lukas performs with his dad on several of the album's tracks including a droll soulful take on the Tom Waits and Kathleen Brennan composition, »Come On Up To The House,« sung with Sheryl Crow. Willie revisits the roots of classic country with three pre-rock gems: the 1930's ballad »My Window Faces The South,« Fred Rose's immortal »Home In San Antone« from 1943, and 1949's »Cold War With You,« a still timely take on the battle of the sexes with guest artist Ray Price. 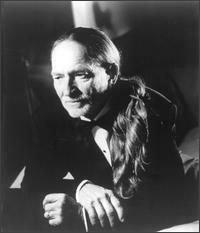 (Price made Willie's composition, »Night Life,« a smash in 1960 and Willie served as a member of Ray's band, the Cherokee Cowboys). Willie's interpretation of Coldplay's »The Scientist,« featured in an acclaimed animated short film produced by Chipotle to demonstrate the company's commitment to sustainably raised food, is featured on Heroes. The album's focus track is Willie's sublime interpretation of Pearl Jam's »Just Breathe,« performed with Lukas.